The stunning Marquise cut diamond, sometimes referred to as the navette shape diamond, dates back to 18th century France. King Louis XV ordered royal jewellers to cut diamonds to resemble the lips of his lover, Marquise de Pompadour. What is a marquise diamond? Marquise diamonds possess an elongated elliptical shape with pointed ends. A Marquise diamond typically has 58 facets. 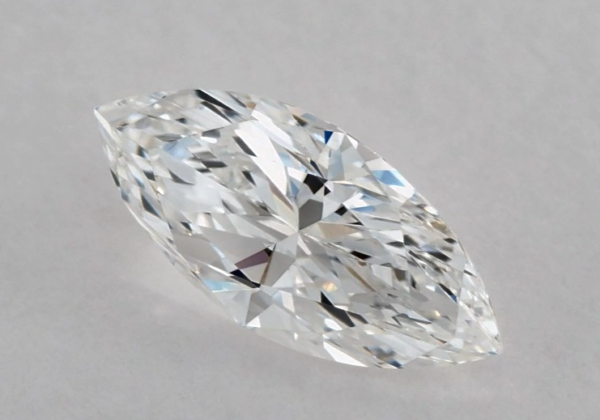 Due to their long and narrow shape, Marquise diamonds can create the illusion of greater size. 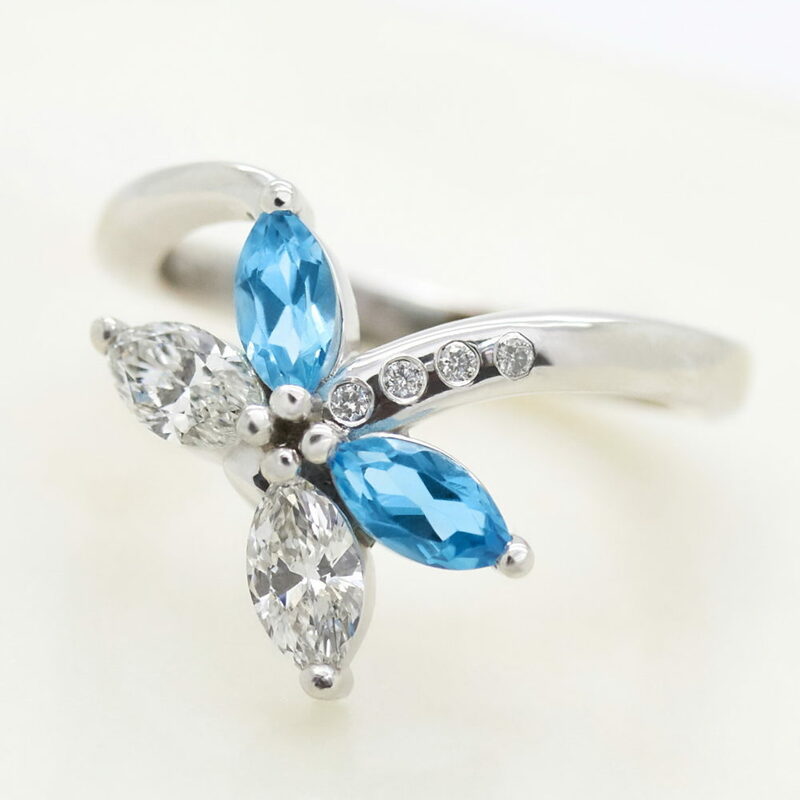 Their elongated shape is also known to flatter the wearer by making the finger appear longer and slimmer. Why should I choose a Marquise diamond? Steeped in historical romance, this cut has a strong presence–one that will certainly stand out. Its unique elongated shape with pointed ends demands to be the centre of attention. Marquise diamonds can be set vertically or horizontally or even as accent side stones. 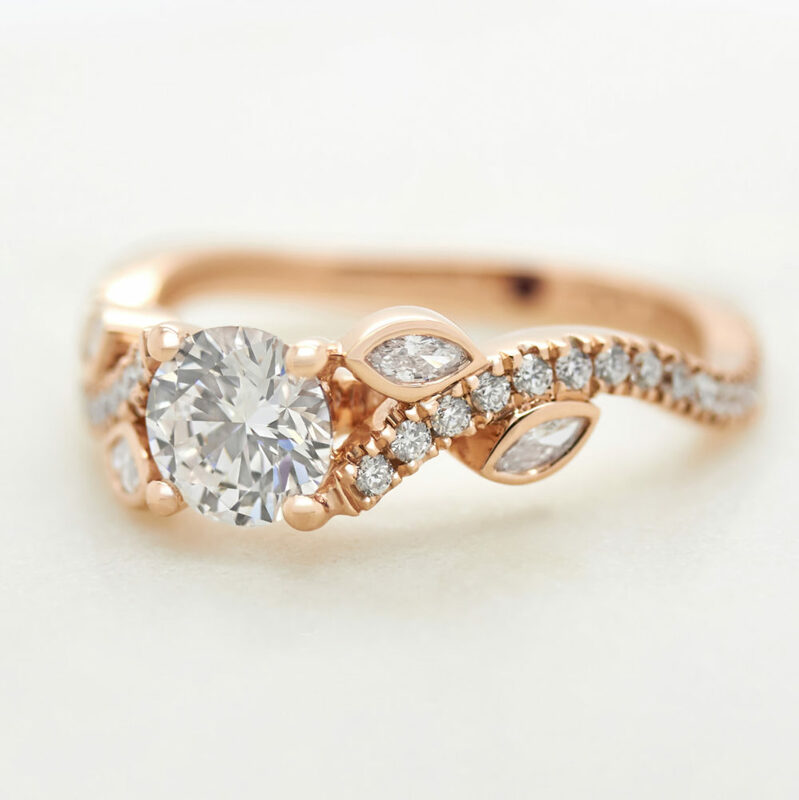 Most rings feature a vertical placement, set in the more traditional north-south setting for a more traditional style. 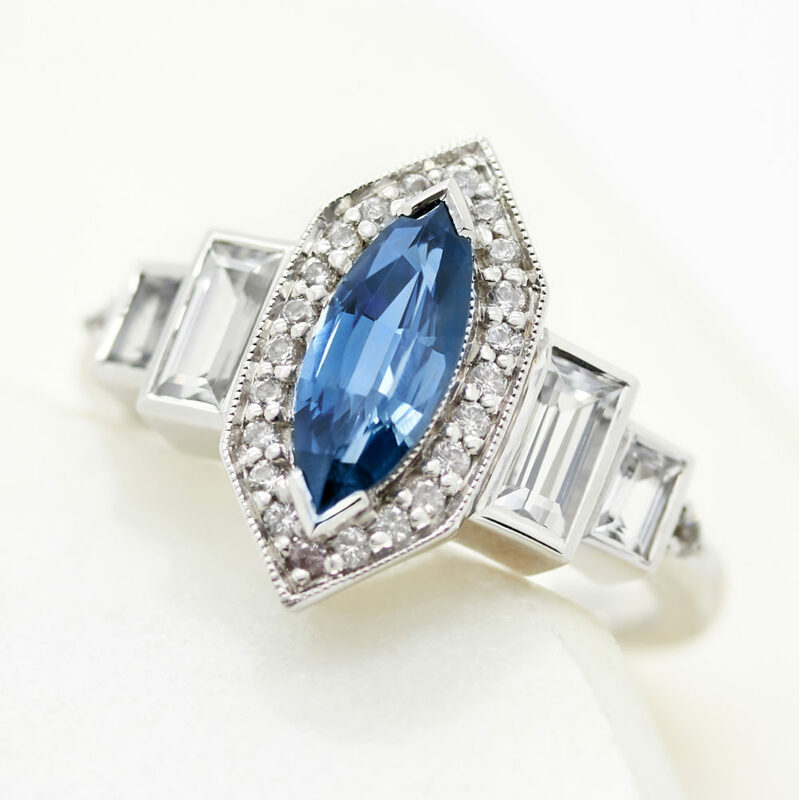 However, actresses Catherine Zeta-Jones and Portia de Rossi both wear east-west Marquise engagement rings–giving a contemporary finish on an otherwise very traditional item of jewellery. What factors should I consider when choosing a Marquise diamond? Some Marquise shaped diamonds may have a bow-tie effect which occurs when light doesn’t bounce into the middle of the diamond because of the way the diamond is cut. This appears as a bow-tie shape darkness visible in the centre of the diamond. 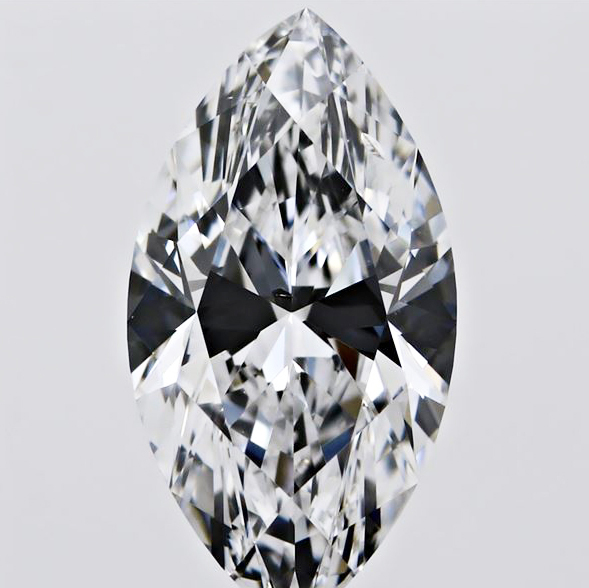 While most agree that this is part of a Marquise diamond’s beauty, a severe effect is undesirable. All of our diamonds are hand-inspected to ensure they do not possess a strongly visible bow-tie effect. If you’re looking for a large presence on the finger, look no further than the Marquise. This shape has a larger spread on the finger than many others of equal carat weight. A magnificent choice for those wanting to elongate the look of their finger–it’s basically a win-win! What is the best ratio for a Marquise cut diamond? Marquise ratio should be lead by personal preference. 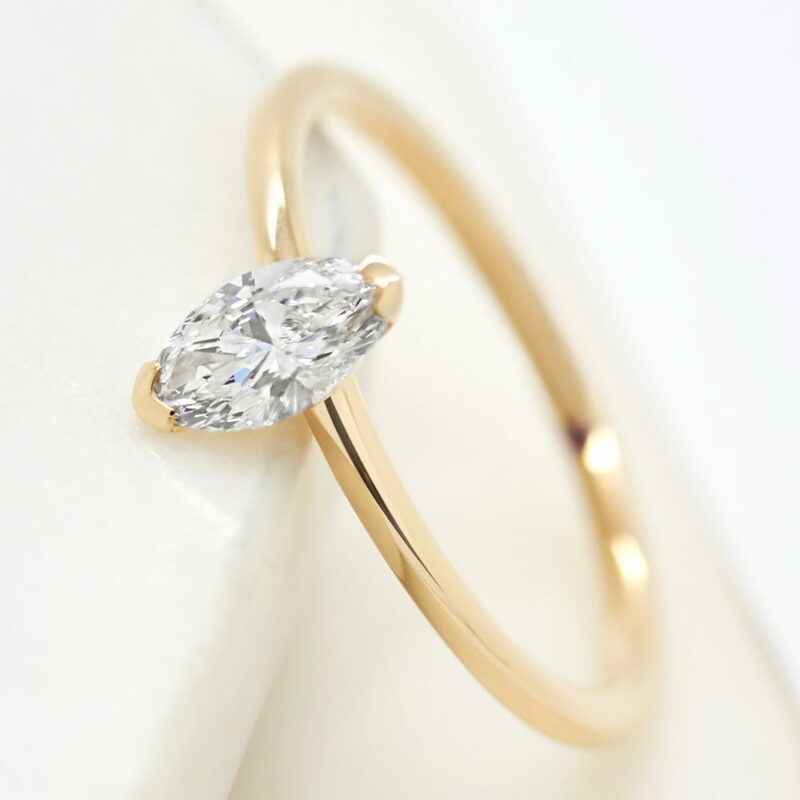 For a more rounded, wider Marquise shape, a lower ratio is needed. For a narrower, elongated shape, a higher ratio should be chosen. Marquise diamonds typically have a 1.85 – 2.00 ratio, making its length around twice the size of its width, which is considered an ideal balance. While Marquise cut diamonds don’t have an official cut grade, the chart below serves as a general guide to use when considering the cut of a marquise diamond. What colour should I choose for a Marquise cut diamond? Evaluating colour in Marquise cut diamonds is entirely dependent on the preference of its buyer or wearer. Customers may prefer the warmer tones of colour grades G-H to the icy cool tones of colour grades D-F, especially when set in rose or yellow gold. The truth is, the difference between these two colour grade ranges is difficult to perceive, especially to the naked eye. Clarity in Marquise cut diamonds is dependent on personal preference. Some people may be entirely comfortable with a diamond that features clarity characteristics (also known as inclusions) that aren’t visible to the naked eye. Others may insist on a technically flawless appearance for absolute perfection. To ensure the brilliance and fire that makes diamonds so enchanting, we offer and recommend SI1 clarity grades or higher.